Update to Tane Norther's Heroes 3 (SoD) map pack is finally coming out! 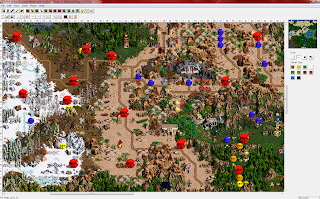 To everyone who's interested on my fan made Heroes 3 (Shadow of Death) maps, I've finally completed a new map which will be added to my map pack (Tane Norther's Heroes of Might And Magic III (SoD) XL-map pack) very soon. It's called Forest Of The Old Godz and the map has been on development for about half year. I would say, that this is "the grand map" of all, this far. And I'm quite proud of it. I had fun time creating it, and sure, it didn't take whole half-year development at full-speed. Sometimes I was making the map more intensively, while sometimes not so. Creating the "events" for the map took a whole lot of time, as English is not my first language. In addition, I have made small update on Star Dimension X, which now features possibility to play the map with four (4) more additional (random) towns located on the underground area at the very edges. By playtesting the map several times, I figured out that the time to get to the prior closest neutral town took a bit too long time, and that hampered chances to keep the map interesting in the beginning. With the added towns, the map now works way better in my opinion and is more fun to play. The version with more towns will be marked with a plus (+) sign on the map name. *Both (underground and overworld) sides of the map have been used as full-sized overworld areas, connected to each other with teleports in logical manner.